Charlie Sepiida swings his clenched fist into the placid lake, the frigid water splashing his boots and legs, and soon the entire cove registers the ripples that radiate out from his crouched form. He is tired, cold, and visibly discouraged. This is the final day of Sepiida’s lonely week-long spring equinoctial expedition. Around him, snowy firs appear as a crowd of bystanders huddled against the elements, silently watching the broken man as he lifts his open hand to reveal nothing but the lake water slipping through his fingers. “So you’ve actually grappled with this…this monster?” I ask. Above and below the water at Waldo Lake. Photo by Tyson Gillard. Sepiida’s circuit includes some of the West’s best. 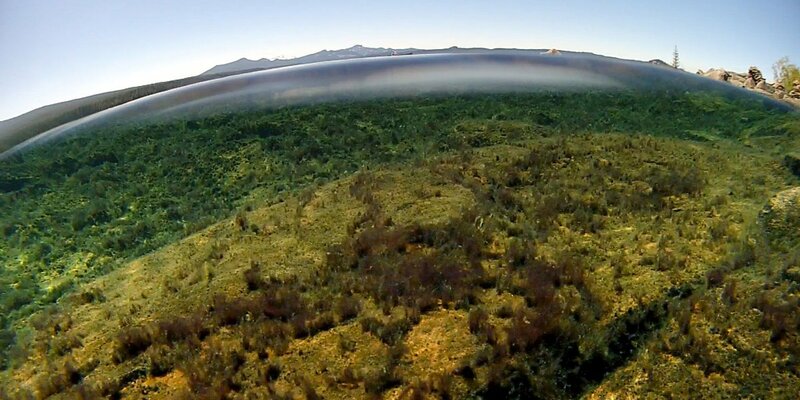 In addition to Lake Tahoe and Waldo Lake, each famous for its water clarity. Crater Lake, the country’s deepest, is practically a second home. Look closely near the waterline due east of Wizard Island to find the stone shelter he uses as he waits patiently for the beast to show itself. Farther north, Ross Lake, Baker Lake, and Lake Chelan are all known or suspected haunts, and sightings in Washington are nearly as frequent as they are in Minnesota, now widely considered to be Nessy’s home away from home. Farther north in Canada, Nessy is known to splash and giggle in British Columbia's Lillooet Lake or Alberta's Bertha Lake. When in California and not in Lake Tahoe, Tenaya Lake and Lake Merced are common choices, though the drought has taken its toll on her zeal for California waters. Well said, Sepiida, well said. Begin your own search for a lake near you.